Is there a link between the Higgs boson and dark energy? The Universe is expanding at an accelerating rate and we’re not entirely sure why. To deal with the problem, scientists have conjured up dark energy, a mysterious force that permeates all of space. 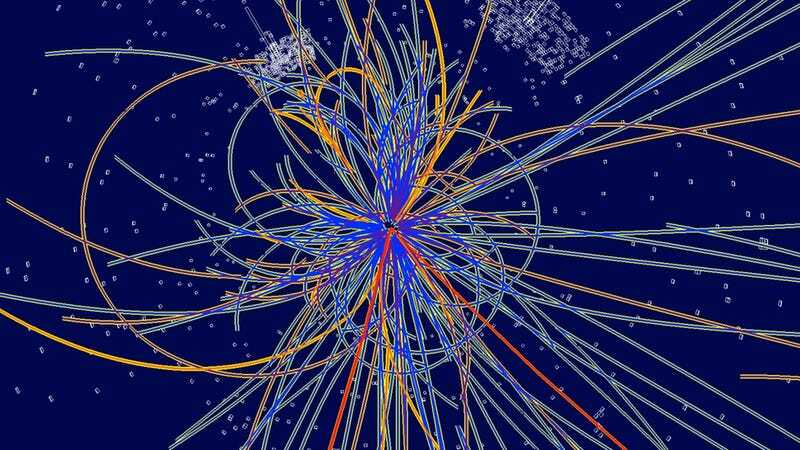 Now, a pair of physicists say the newly discovered Higgs boson could help explain where it all comes from. Dark energy is the best theory we’ve got going right now to explain why the universe is expanding at an accelerating rate. To make our observations of the cosmos work, physicists figure that the total mass-energy of the universe contains 4.9% regular matter, 26.8% dark matter, and nearly 70% dark energy. What does dark energy mean for the end of the universe? This energy, which certainly appears to dominate the total energy density of the universe, has a ridiculously small value. So small, in fact, that it’s about 122 orders of magnitude less than what would be expected when applying fundamental physics. This has given rise to the cosmological constant problem — the struggle to understand why the vacuum energy is so freakishly small. And in fact, it’s considered the biggest fine-tuning puzzle in physics. Where dark energy comes from and why its magnitude matches the supposed magnitude of the energy in empty space is a profound mystery. Did the Higgs boson discovery reveal that the universe is unnatural? The Higgs boson, the presence of which was confirmed on July 4, 2012, is an elementary particle that has largely affirmed the existence of the Higgs field — a crucial aspect to the Standard Model. It explains why certain fundamental particles have mass, and why the weak nuclear force exhibits characteristics that distinguish it from the electromagnetic force. And indeed, by studying the Higgs boson and Higgs field, physicists could gain some important insights into the universe’s beginning‚ a time when a brief burst of inflationary expansion planted the seeds for the galaxies, and by consequence, dark energy itself. That burst of expansion was supposedly caused by a scalar field in space, much like the Higgs field. In fact, some physicists have even proposed that the Higgs field itself might have been the inflation instigator. In any event, finally having a scalar particle to study should shed light on that universe-initiating event. It may even be that “dark energy,” the mysterious force that even now drives the universe to expand at an accelerating rate, is itself a scalar field. Krauss and Dent have now taken this line of inquiry further. They speculate that there may be a small link, or coupling, between the Higgs particle and other hypothetical particles that could be associated with the so-called Grand Unified Scale — a scale that’s about 16 orders of magnitude smaller than protons and where the three known non-gravitational forces in nature might converge into a single theory (those being electromagnetism and the strong and weak nuclear forces). This coupling could create another background field in nature in addition to the Higgs field. And fascinatingly, it could theoretically contribute an energy density to empty space at the exact same scale that corresponds to the observed energy density. According to lead author Krauss, this linkage and resulting background field could provide a possible “portal” to physics at higher energy scales — and through very small mixings and couplings to new scalar fields that could work at such scales. All the matter particles are spin-1/2 fermions. All the force carriers are spin-1 bosons. Higgs particles are spin-0 bosons (scalars). The Higgs is neither matter nor force. The Higgs is just different. This would be the first fundamental scalar ever discovered. The Higgs field is thought to fill the entire universe. Could it give some handle of dark energy (scalar field)? Many modern theories predict other scalar particles like the Higgs. Why, after all, should the Higgs be the only one of its kind? [The] LHC can search for and study new scalars with precision. Also, the Krauss and Dent paper, at a scant 4-pages long, is not what you would call exhaustive or rigorous. The physicists are merely throwing their interesting notion into the idea pool. And indeed, the challenge now will be to find a way to test and prove their conjecture. Whether our mechanism can be incorporated naturally into a fully phenomenological particle physics framework remains to be seen. However, it does open the possibility that a solution to at least the ﬁne-tuning puzzle in the context of a solution to the deeper cosmological constant puzzle may involve solving a potentially simpler Higgs-saw puzzle. Read the entire study at Physical Review Letters: “Higgs Seesaw Mechanism as a Source for Dark Energy.” Also available here.